Autoreactive CD8+ T lymphocytes play a key role in the pathogenesis of several autoimmune diseases. It is not yet well understood how autoreactive CD8+ T cells, which express TCRs with low reactivity toward self-Ags, gain the ability to respond to autoantigens to cause disease. Previously, we have shown that prior stimulation of CD8+ T cells with synergistic combinations of cytokines produced by the innate immune response, such as IL-21 and IL-15, induces Ag-independent proliferation. Such “cytokine-primed” CD8 T cells displayed increased responsiveness to limiting quantities of the cognate Ag. In this paper, we report that prior stimulation with IL-15 and IL-21 also enables CD8+ T cells to respond to weakly agonistic TCR ligands, resulting in proliferation, cytokine secretion, and cytolytic activity. Using a transgenic mouse model of autoimmune diabetes, we show that cytokine-primed autoreactive CD8+ T cells induce disease following stimulation by weak TCR ligands, but their diabetogenic potential is dependent on continuous availability of IL-15 in vivo. These findings suggest that inflammatory cytokines could facilitate the triggering of autoreactive CD8+ T cells by weak autoantigens, and this mechanism may have important implications for autoimmune diseases associated with microbial infections and chronic inflammation. CD8+ cytotoxic T lymphocytes play a key role in several autoimmune diseases (1–4). However, cellular and molecular events preceding the initial activation of autoreactive CD8 T cells remain poorly understood (4). During intrathymic development, T cells bearing TCRs that display strong reactivity toward autoantigens are eliminated by negative selection (5). Therefore, potentially autoreactive CD8+ T cells that enter peripheral circulation bear TCRs with low reactivity toward autoantigens. Increasing the magnitude of TCR signaling, for example, through ablation of Cbl-b, a negative regulator of TCR signaling, can facilitate stimulation of autoreactive CD8+ T cells by weak TCR ligands and cause disease in an experimental model of autoimmune diabetes (6). Several recent reports have shown an important role for the inflammatory cytokines IL-6 and IL-21 as well as the homeostatic cytokines IL-15 and IL-7 in activating autoreactive CD8+ T cells. In a murine model of autoimmune colitis, IL-6–dependent spontaneous proliferation of colitogenic CD8+ T cells and their conversion to IL-17–producing effector cells underlie the pathogenic process (7). In the NOD mouse model, genetic ablation of IL-21Rα abrogated the development of autoimmune diabetes (8–10). In a mouse model of autoimmune diabetes, IL-7 promoted the activation of autoreactive CD8 T cells by facilitating CD4 T cells to provide help (11). In humans, activation of CTLs via TCR-independent NKG2D signaling pathway by IL-15 was suggested to be a pathogenic mechanism underlying celiac disease (12). Consistent with this report, transgenic mice expressing human IL-15 in enterocytes accumulated NK-like CD8+ lymphocytes, which caused autoimmune intestinal damage (13). Whereas the above studies implicated IL-6, IL-21, IL-7, and IL-15 in promoting survival, proliferation, and effector functions of autoreactive CD8+ T cells, whether these cytokines also contributed to the initial triggering of autoreactive CD8+ T cells was not addressed. Previously, we have shown that stimulation of CD8+ T cells with IL-21 or IL-6, in the presence of IL-7 or IL-15, induces Ag-independent proliferation and increases their subsequent response to Ag (14, 15). We refer the cytokine-induced augmentation of TCR responsiveness as “cytokine priming” (16). In this study, we investigated whether cytokine priming enabled autoreactive CD8+ T cells to respond to weakly agonistic Ags and induced their pathogenic potential. For this purpose, we used a mouse model of autoimmune diabetes, in which the glycoprotein (GP) Ag of lymphocytic choriomeningitis virus (LCMV) is expressed under the rat insulin promoter (RIP-GP) (17). The antigenic peptide spanning aa 33–41 of LCMV GP (gp33) is the cognate ligand for CD8+ T cells that express the transgenic P14 TCR (P14 cells). However, P14 cells are not pathogenic either in RIP-GP/P14 double transgenic mice, or following adoptive transfer to RIP-GP recipients, because of the low level expression of LCMV GP in the islets (17). These “ignorant” P14 cells can be activated to induce diabetes in RIP-GP mice by LCMV infection or by immunization with gp33 peptide and concomitant induction of inflammatory response by the TLR3 ligand polyinosinic:polycytidylic acid [poly(I:C)] (18, 19). We have observed that P14 cells stimulated in vitro with gp33-induced diabetes in RIP-GP mice without the requirement for LCMV infection or peptide immunization. Our findings reported in this paper show that cytokine priming enables P14 cells to respond to weak TCR agonists with robust proliferation and potent effector functions, and these cells can induce diabetes upon adoptive transfer to RIP-GP mice. C57BL/6, pmel-1 TCR transgenic, and NOD mice expressing the transgenic 8.3 TCR (8.3-NOD; NOD.Cg-Tg(TcraTcrbNY8.3)1Pesa/DvsJ) transgenic mice were purchased from The Jackson Laboratory. The P14 TCR transgenic mouse and the RIP-GP transgenic mouse have been described previously (6). Il15−/− mice on C57BL/6 background were purchased from Taconic. RIP-GP mice lacking IL-15 were bred at our animal facility. All animal experiments were carried out in accordance with institutional guidelines. Abs against mouse CD4, CD5, CD8, CD16/CD32, CD25, CD28, CD44, 4-1BB, GITR, and TCR vα2 (recognizes the P14 TCR), conjugated to FITC, PE, or biotin, were purchased from BD Biosciences (Palo Alto, CA) or eBioscience (San Diego, CA). Ab against granzyme B was from Invitrogen-Caltag Laboratories. Recombinant cytokines IL-7, IL-15, and IL-21 were purchased from R&D Systems (Minneapolis, MN). Poly(I:C) was obtained from InvivoGen (San Diego, CA). Antigenic peptides were custom synthesized to >95% purity by GenScript (Scotch Plains, NJ). Flow cytometry analysis was carried out as detailed previously using FACSCanto (BD Biosciences) (14). CD8+ T cells were negatively purified from 4- to 6-wk-old mice using Dynal magnetic beads (Invitrogen) to 95–98% purity (14). More than 95% of these cells displayed CD44lo naive phenotype. In some experiments, the small proportion of CD44hi memory-phenotype cells were removed by positive selection using anti-CD44 Ab as described elsewhere (15). Total lymph node cells (1 × 106 cells/ml) or purified naive CD8 T cells (1 × 106 cells/ml) were cultured in 12-well culture dishes in RPMI 1640 medium containing 10% heat-inactivated FBS (Sigma-Aldrich) with the indicated cytokines for 36–40 h. The cells were harvested and washed three times with PBS to remove the priming cytokines before stimulation with TCR ligands. Purified naive CD8 T cells or cytokine-prestimulated TCR transgenic CD8 T cells were seeded at a concentration of 2.5 × 104 cells/well in 96-well microtiter plates along with 105 irradiated C57BL/6 splenocytes as APC for the indicated antigenic peptides. After 48 h, cell proliferation was measured by [3H]thymidine incorporation as described previously (14). The amount of IFN-γ in the culture supernatants was determined by sandwich ELISA using Ab pairs purchased from BD Biosciences. CTL activity of P14 cells was measured by standard 51Cr release assay using gp33 peptide-pulsed EL-4 target cells as detailed previously (14). Type 1 diabetes in the RIP-GP model was induced by slight modification of an established protocol in which RIP-GP mice are immunized with gp33 peptide and concomitantly administered poly(I:C) (19). Briefly, 3 × 106 naive or cytokine-primed P14 cells stimulated in vitro with agonist (gp33) or weak agonist (W4Y) peptide Ag were injected i.v. into RIP-GP or Il15−/− RIP-GP recipients along with 200 μg poly(I:C). Blood glucose levels were monitored using Accu-Check strips (Roche Diagnostics). Animals that showed >15 mmol/l blood glucose consecutively for 3 d were considered diabetic. At the time of sacrifice, pancreatic tissues were immersed in Tissue-Tek OCT and snap frozen in liquid nitrogen for immunohistochemical evaluation of islet destruction. Animals that did not develop diabetes were sacrificed 4 wk after adoptive cell transfer. Serial 5-μm sections of the frozen pancreas were fixed in cold acetone for 10 min and rinsed in PBS. After blocking endogenous HRP activity with 3% hydrogen peroxide for 15 min at room temperature, the tissue sections were washed and incubated with 2% BSA in PBS containing 0.2% Triton X-100 for 45 min. Following sequential incubation with anti-insulin or anti-glucagon (Abcam) Ab overnight at 4°C and HRP-conjugated secondary Ab for 2 h, the slides were developed using diaminobenzidine as chromogen for 15 min. The sections were counterstained with Harris’ hematoxylin, mounted using Aqua-mount (Fisher), and examined under a light microscope. Some slides were examined by immunofluorescence microscopy following staining with fluorochrome-conjugated secondary Ab. The p values were determined by Student t test and log-rank test. Peptide ligands of the P14 TCR with weak agonist activity (L6F, A4Y, and W4Y), generated by mutation of the TCR contact residues of the cognate peptide ligand gp33 (KAVYNFATC), were reported earlier (20). The peptide:MHC complexes of L6F, A4Y, and W4Y displayed faster dissociation rates from the P14 TCR with t1/2 values of 12.1, 10.0, and 17.7 min, respectively, compared with 101 min for the gp33 peptide (20). The weak TCR ligands of the P14 TCR are less efficient in inducing calcium flux, proliferation, or effector functions (21, 22). To determine whether cytokine priming modulated the responses of P14 cells to weak agonists, we purified P14 cells from 4- to 6-wk-old mice and stimulated them with IL-21 either alone or in the presence of IL-7 or IL-15 for 36–40 h before stimulation with varying concentrations of agonistic (gp33) or weakly agonistic peptides. As shown previously (14), P14 cells primed with IL-21 in the presence of either IL-7 or IL-15 showed significantly increased proliferation in response to a limiting concentration of gp33 compared with cells primed with IL-7 or IL-15 alone (Fig. 1A). Compared with freshly isolated cells, P14 cells incubated with IL-21 alone showed markedly decreased proliferation, probably because IL-21 at the concentration used in this study is less efficient than IL-7 or IL-15 in providing survival signals to naive CD8 T cells (23). 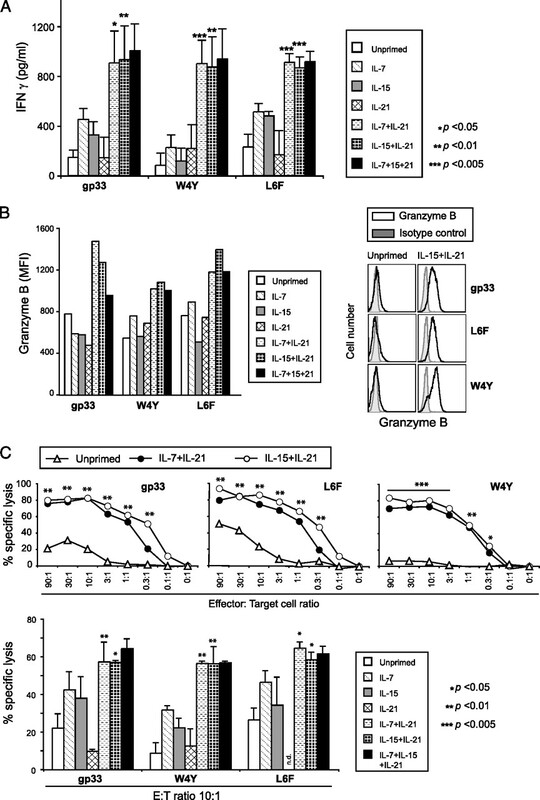 In contrast, cells primed with the synergistic combination of IL-21 and IL-7 or IL-15 displayed robust proliferation to L6F, A4Y, and W4Y to which naive P14 cells showed weak to moderate responses (Fig. 1A). Addition of IL-7 to cells primed with IL-15 and IL-21 did not further enhance the proliferative response to the weak agonists (Fig. 1A, right panels). The nonagonist AV peptide, which binds to the restricting MHC class I molecule H-2Db but does not interact with the P14 TCR (20), failed to induce proliferation of cytokine-primed cells (data not shown), indicating that cytokine priming did not enhance cell proliferation in an Ag-nonspecific manner. To address the possibility that the priming cytokines might selectively expand the small fraction of CD44hi memory-phenotype cells, we depleted CD44hi cells prior to priming with IL-7 or IL-15 in the presence or absence of IL-21 (Fig. 1B). Again, IL-21 synergized with IL-7 and IL-15 to induce strong proliferation of these highly purified CD8+CD44lo cells in response to gp33 and the weak TCR ligands (Fig. 1B). These results showed that cytokine priming enabled naive CD8 T cells to proliferate robustly in response to weak TCR agonists. Cytokine priming induces proliferation of naive P14 cells in response to weak TCR ligands. A, Purified P14 cells (>95% CD44loCD122lo; data not shown) cultured for 36–40 h with IL-7 (5 ng/ml) and/or IL-15 (5 ng/ml), either alone or in the presence of IL-21 (10 ng/ml), were washed and stimulated with the indicated concentrations of gp33 peptide or the indicated altered peptide ligands (amino acid substitutions are indicated in bold) presented by irradiated C57BL/6 splenocytes as APC. Freshly isolated (unprimed) P14 cells were used as controls. Cell proliferation was measured by [3H]thymidine incorporation after 2 d. Representative data (mean + SD) from at least three experiments are shown for each peptide. In all experiments, responses of cytokine-primed cells were compared with unprimed cells by Student t test. B, CD8+CD44lo naive P14 cells, isolated by magnetic depletion of CD44hi cells from negatively purified CD8 T cells (top panels), were stimulated, either immediately or after exposure to the indicated cytokines for 40 h, with the indicated concentrations of the various peptides presented by irradiated C57BL/6 splenocytes as APC. Cell proliferation was measured by [3H]thymidine incorporation. Representative data from two similar experiments for each peptide are shown. Next, we compared the effector functions of naive and cytokine-primed P14 cells upon subsequent stimulation with agonist or the weakly agonistic peptides for 2 d. As shown in Fig. 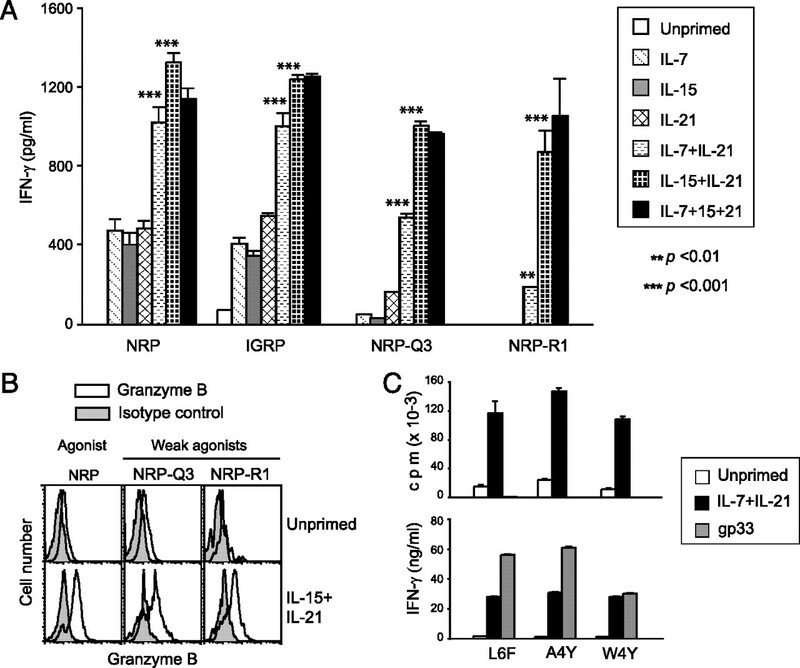 2A, P14 cells primed with IL-21 and IL-7 or IL-15 produced abundant quantities of IFN-γ following stimulation with gp33 or the weak agonists W4Y and L6F compared with naive P14 cells or cells exposed to the individual cytokines. In response to stimulation with gp33 or the weak agonists, P14 cells primed with the synergistic combination of cytokines also showed increased expression of granzyme B (Fig. 2B) and displayed potent Ag-specific cytolytic activity toward gp33 peptide-loaded targets over a wide range of effector to target cell ratio (Fig. 2C). This increased cytolytic potential of cytokine-primed cells was not due to nonspecific lytic activity, because they did not lyse target cells loaded with the nonagonist AV peptide (data not shown). Even though priming with IL-7 or IL-15 appreciably increased the CTL activity compared with unprimed cells, these responses were significantly boosted by the addition of IL-21 during priming (Fig. 2C, lower panel). Collectively, these results showed that cytokine priming of CD8 T cells not only induced proliferation but also elicited effector functions in response to weak TCR ligands. Cytokine-primed naive P14 cells stimulated with weak TCR agonists display strong Ag-specific effector responses. Purified P14 cells cultured with IL-7 and/or IL-15 in the presence of IL-21 for 40 h were washed and stimulated with 0.01 μg/ml of the indicated TCR ligands for 2 d. A, IFN-γ in the culture supernatant was quantified by ELISA. B, Intracellular granzyme B was evaluated by flow cytometry, and the mean fluorescent intensity of granzyme B staining is shown in the left panel for all the cytokines used for priming. Representative FACS profile is shown for cells primed with IL-15 and IL-21 and then stimulated with the indicated peptides. C, Cytolytic activity was measured using gp33-loaded target cells at different E:T cell ratio. A comparison to cells primed with IL-7, IL-15, or IL-21 was made at the E:T cell ratio of 10:1 to illustrate the superior priming effect of the synergistic cytokine combinations. For all experiments, data shown are representative of at least three independent experiments. Student t test was used to compare cytokine-primed and unprimed cells. To determine whether the cytokine-induced enhancement of TCR reactivity to weak agonists occurred in CD8 T cells of different TCR specificities, we used CD8 T cells expressing two other TCR specificities in different genetic backgrounds. The pmel1 TCR in the C57BL/6 background recognizes an H-2Db–restricted peptide spanning aa 25–33 of the melanoma-associated Ag gp100 (24). However, because of differences in the TCR contact residues, the human gp100-derived peptide (KVPRNQDWL) possesses a stronger agonistic activity toward the pmel-1 TCR than the mouse gp100-derived peptide (EGSRNQDWL) (24). When primed with IL-15, the presence of IL-21 strongly boosted the proliferation of pmel-1 cells in response to the mgp100-derived peptide (Fig. 3A). In parallel, we examined CD8 T cells isolated from the 8.3 TCR transgenic mouse in the NOD background (25). The agonist peptide of the 8.3 TCR, NRP (KYNKANWFL), originally identified from a combinatorial peptide library, retains the MHC (H-2Kd) and TCR contact residues of the cognate peptide that was discovered later in the islet-specific autoantigen, glucose-6-phosphatase catalytic subunit-related protein206–214 (VYLKTNKFL) (26, 27). Peptide variants of NRP generated by single amino acid substitution, NRP-Q3, NRP-R1, and NRP-V5, were shown to display negligible agonist activity on freshly isolated 8.3 T cells but were able to stimulate IFN-γ secretion in cells previously stimulated with the cognate peptide NRP (28). As shown in Fig. 3B, priming with the synergistic cytokine combinations not only increased the sensitivity of 8.3 cells toward NRP but also induced strong proliferation in response to the weak agonists NRP-Q3 and NRP-R1 but not toward the nonagonist peptide TUM. Again, priming with the cytokines individually did not boost the response (Fig. 3B, lower panel). Similar to P14 cells, 8.3 cells primed with IL-21 in the presence of IL-7 or IL-15 produced significantly larger amounts of IFN-γ than cells primed with the individual cytokines, following stimulation with NRP, glucose-6-phosphatase catalytic subunit-related protein, or the weak agonists (Fig. 4A). The cytokine-primed 8.3-NOD cells also showed increased upregulation of granzyme B following stimulation with NRP or weak agonists (Fig. 4B). These results indicated that the priming effect of IL-21 in the presence of IL-7 or IL-15 could occur on CD8 T cells with diverse TCR specificities. Cytokine priming increases the responsiveness of CD8 T cells bearing the pmel1 or the 8.3-NOD TCR toward weak TCR ligands. A, CD8 T cells isolated from 6- to 8-wk-old Pmel1 TCR transgenic mice in C57BL/6 background were cultured for 40 h with IL-15 and/or IL-21 for 40 h, washed, and then stimulated with the mgp100 peptide presented by irradiated C57BL/6 splenocytes. Freshly isolated cells were used as a control. Cell proliferation was measured by [3H]thymidine incorporation after 2 d. Representative data from three experiments with similar results are shown. B, Purified 8.3-NOD cells, cultured for 40 h with IL-7 or IL-15 in the presence of IL-21 for 40 h, were washed and stimulated with the indicated TCR ligands (animo acid substitutions are indicated in bold) presented by irradiated splenocytes from the NOD mouse. Cell proliferation was measured by [3H]thymidine incorporation after 2 d. Data shown (mean + SD) are representative of three separate experiments. The individual cytokines, when used for priming, did not appreciably increase the proliferative response (lower panel). Responses of cytokine-primed and unprimed cells were compared by Student t test. Increased Ag-specific effector functions of cytokine-primed 8.3-NOD T cells following stimulation with weak TCR agonists. A, Secretion of IFN-γ by naive and cytokine-primed 8.3-NOD cells was measured 2 d after stimulation with 1 μg/ml of the indicated peptides. B, Intracellular granzyme B was evaluated by flow cytometry. Individually, IL-7, IL-15, or IL-21 did not enhance granzyme B expression (data not shown). C, Ag-stimulated P14 cells fail to proliferate in response to gp33 but display effector functions. Total lymph node cells from P14 mice, cultured with gp33 or IL-7 and IL-21 for 2 d, were washed to remove cytokines, equalized for CD8+ T cell number, and stimulated with the indicated TCR ligands presented by irradiated APC. Proliferation (upper panel) and IFN-γ in the culture supernatant (lower panel) were measured after 2 d. Results from one of the two identical experiments are shown. Earlier reports showed that CD8 T cells gain reactivity toward weak agonists following Ag stimulation (26, 28–31). Our findings demonstrated that TCR responsiveness toward weak agonists could be increased by cytokines in an Ag-independent manner. Moreover, increased TCR sensitivity resulting from cytokine priming differed from that induced by Ag. Ag-induced augmentation of TCR sensitivity to weak agonists was associated with increased IFN-γ production and cytolytic activity in 8.3 T cells but compromised their proliferative response (31), which was also true with gp33-stimulated P14 cells (Fig. 4C). In contrast, cytokine-primed P14 and 8.3 cells not only displayed heightened effector functions but also proliferated robustly in response to weak agonists (Figs. 1–4). The above findings raised the possibility that cytokine priming, which might occur in vivo at localized sites of inflammation induced by microbial infections and chronic inflammatory conditions, might trigger potentially autoreactive CD8 T cells by weakly agonistic autoantigens. To test this idea, we adoptively transferred cytokine-primed P14 cells into RIP-GP transgenic mice. Freshly isolated P14 cells adoptively transferred to RIP-GP mice remain ignorant of the LCMV GP in the islets because of low-level expression of the transgenic Ag and thus do not cause diabetes. However, these cells can be induced to cause disease upon activation by LCMV infection or gp33 peptide immunization with concomitant induction of inflammatory response by poly(I:C) (19). Poly(I:C) provides innate immune stimulation to upregulate MHC class I on the pancreatic β cells to render them susceptible to autoreactive CTLs (19). We observed that in vitro stimulation of naive P14 cells with optimal concentration of the cognate peptide gp33 (0.1 μg/ml) before adoptive transfer could substitute for peptide immunization for inducing diabetes (Fig. 5A, groups A1 and A2b, 5Bi). However, these gp33-stimulated cells still required concomitant induction of inflammatory response by poly(I:C) to induce disease (Fig. 5A, group A2a). We used this approach of in vitro peptide stimulation to determine whether cytokine-primed P14 cells, because of their increased Ag responsiveness, would become pathogenic upon suboptimal TCR stimulation. Whereas P14 cells stimulated directly with a suboptimal concentration of gp33 (0.001 μg/ml) did not induce autoimmune type 1 diabetes (T1D) in RIP-GP mice, P14 cells primed with IL-15 and IL-21 before suboptimal TCR stimulation acquired the ability to cause disease (Fig. 5A, groups A3 versus B3, 5Bii). However, priming with the combination of IL-7 and IL-21 failed to elicit the diabetogenic potential of P14 cells upon suboptimal stimulation with gp33 (Fig. 5A, group B4). Priming with IL-15 and IL-21 alone was insufficient to elicit the pathogenecity of P14 cells without subsequent Ag stimulation (Fig. 5A, group B1). Furthermore, cytokine priming did not obviate the need for poly(I:C) to induce diabetes by gp33-stimulated P14 cells (Fig. 5A, groups B2b). Importantly, cytokine priming elicited the diabetogenic potential of P14 cells following stimulation with the weak agonist W4Y (Fig. 4A, groups C1 versus C2, 4Biii, 4Biv). These results indicate that autoreactive CD8 T cells that are sufficiently stimulated by the priming cytokines could gain pathogenic potential upon exposure to autoantigens; however, the ability of these cells to cause tissue destruction is dependent on sensitization of the target cells by ongoing inflammation. Cytokine priming enables naive P14 cells to induce T1D in RIP-GP recipients following weak TCR stimulation. A, Naive and cytokine-primed P14 cells were stimulated with the indicated concentrations of gp33 or the weak agonist W4Y for 48 h, and 3 × 106 cells were adoptively transferred to RIP-GP recipients which are either wild type or deficient for IL-15. Poly(I:C) (200 μg/mouse, i.v) was administered at the same time as cell transfer. Blood glucose was monitored from day 3 after cell transfer. All recipients that developed T1D showed clinical symptoms within one week. Animals that did not develop T1D were followed for up to 4 wk. n.d., not done. Statistical significance between groups was determined by log-rank test. *p < 0.005, **p < 0.001. B, Serial 5-μm sections of frozen pancreas from RIP-GP recipients of P14 cells, which were stimulated with the indicated TCR ligands with or without prior cytokine priming as indicated in i–iv, were stained with H&E or anti-insulin Ab by immunohistochemistry. Arrows indicate islets. Another set of sections was evaluated for insulin (green) and glucagon (red) staining by immunofluorescence. Nuclei were stained with DAPI (blue). For comparison, immunofluorescence staining pancreas from RIP-GP mice that received unstimulated P14 cells (v) or cells stimulated with suboptimal concentration of gp33 (vi) are shown. We have previously shown that stimulation with IL-15 and IL-21 enhances the expression of CD122 and CD132, the signaling chains of the IL-15R complex (14). Because IL-15 is implicated in several inflammatory and autoimmune diseases (12, 32, 33), we used RIP-GP recipients lacking IL-15 to assess whether induction of diabetes by cytokine-primed P14 cells stimulated with TCR agonists was dependent on the continuous availability of IL-15. Whereas naive P14 cells stimulated with the optimal concentration of gp33 (0.1 μg/ml) did not require continuous availability of IL-15 to induce T1D, cytokine-primed P14 cells stimulated with suboptimal concentration of gp33 (0.001 μg/ml) or the weak agonist W4Y failed to cause disease in RIP-GP recipients lacking IL-15 (Fig. 5A, groups A2b, B3, and C2, last column). This requirement for the continuous availability of IL-15 to cause disease did not arise from prior conditioning by IL-15 as shown by the dispensability of IL-15 to induce diabetes by cytokine-primed P14 cells stimulated with optimal concentration of gp33 in Il15−/− RIP-GP recipients (Fig. 5A, group B2a, last column). These results show that cytokine-primed P14 cells stimulated by a weak TCR signal required continuous availability of IL-15 to cause diabetes in RIP-GP mice. Previously, we have shown that infection of RIP-GP/P14 double-transgenic mice with LCMV harboring wild type gp33 induced diabetes within 1 wk, whereas the LCMV strain with the L6F mutation was only partially effective, inducing diabetes in <50% of the animals (6). However, both LCMV-WT and LCMV-L6F induced a comparable level of islet infiltration with similar disease kinetics. Even though the reason for diabetes induction in only 50% of the animals infected with LCMV-L6F was unclear, increasing the TCR signaling by genetic ablation of Cbl-b, a negative regulator of TCR signaling, allowed LCMV-L6F to induce disease in all infected RIP-GP/P14 mice (6). We did not observe significant decrease in the expression of Cbl-b and c-Cbl in P14 cells primed with IL-15 and IL-21 (data not shown). In contrast, priming with IL-15 and IL-21 induced a marked downmodulation of CD5 (Fig. 6A), which is also a negative regulator of TCR signaling (34, 35). In contrast to Ag stimulation, which decreases the expression of TCR and CD8, cytokine priming increased the expression of these molecules (Fig. 6A). These modulations of cell surface molecules involved in TCR signaling, which were also elicited by IL-15 and IL-21 individually, could be an important factor contributing to the ability of cytokine-primed CD8 T cells to respond to weak TCR ligands. Cytokine priming upregulates the expression of TCR, CD8, CD28 and GITR, and downmodulates CD5. Total lymph node cells from P14 mice were stimulated with gp33 or the indicated cytokines for 40 h. Stimulated cells and freshly isolated cells were stained for CD8 and the indicated cell surface markers and analyzed by flow cytometry. Expression of cell surface molecules involved in TCR signaling (A) and the costimulatory receptors (B) was evaluated on gated CD8 T cells. 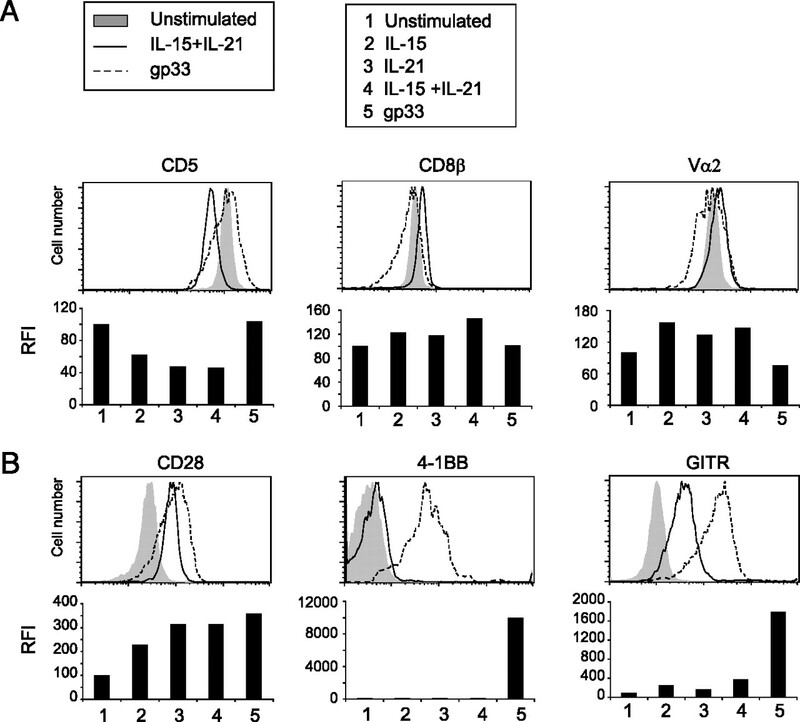 Comparison between cytokine-primed and Ag-stimulated cells, relative to unstimulated cells, is shown as histograms. Comparison with cells cultured with individual cytokines is shown in the bar graph. Relative fluorescence intensity (RFI) was calculated by taking the mean fluorescence intensity of naive cells as 100%. Representative expression profile from three to five experiments is shown for each molecule. Naive human CD8 T cells cultured in IL-15 downmodulate the expression of the costimulatory receptor CD28, whereas concomitant stimulation with IL-21 prevents this downmodulation (36–38). The molecular basis of this differential effect of IL-15 and IL-21 on the expression of human CD28 is unclear. It is possible that differential activation of STATs, STAT5 by IL-15 and STAT3 by IL-21 (14), may underlie the distinct effects of these two cytokines on CD28 gene expression. Sustained induction of CD28 by IL-21 has been correlated to increased Ag-induced expansion of human CD8 T cells and their enhanced CTL activity against tumor Ags (38, 39). Therefore, we examined whether priming with IL-15 and IL-21 similarly sustained the expression of CD28 and influenced the expression of other costimulatory receptors GITR and 4-1BB (40, 41) occurred in cytokine-primed P14 cells. As shown in Fig. 6B, priming of P14 cells with IL-21, either alone or in the presence of IL-15, strongly upregulated CD28 similarly to Ag stimulation in murine CD8 T cells. However, unlike in human CD8 T cells stimulated for 7 d with IL-15 (36), short-term IL-15 stimulation of murine P14 cells for 36–48 h did not diminish but increased the expression of CD28. Whereas Ag stimulation strongly upregulated the expression of GITR and 4-1BB, cytokine priming only modestly increased GITR and did not upregulate 4-1BB (Fig. 6B). These results suggested that increased expression of costimulatory receptors such as CD28 and GITR on cytokine-primed CD8 T cells could also be an important factor in their increased responsiveness toward weak TCR ligands. It is widely perceived that interplay between genetic and environmental factors is required for the induction of autoimmune diseases. One of the environmental factors implicated in the triggering of autoreactive CD8 T cells is microbial pathogens (42, 43). However, molecular mimicry between microbial Ags and autoantigens of the host accounts for only a small proportion of autoimmune diseases (42, 44). Because diverse pathogens seem to be associated with an autoimmune disease (45, 46), it is likely that certain host-specific factors induced by common pathogen-associated molecules might contribute to the triggering autoreactive T cells. Several recent studies have highlighted the importance of the inflammatory cytokines IL-6 and IL-21 and the homeostatic cytokines IL-7 and IL-15 in autoimmune diseases (7, 8, 10–12, 33, 47, 48). These cytokines are implicated in the survival and in boosting the effector phase of autoreactive T cells. However, it still remains to be answered how autoreactive CD8 T cells in the peripheral circulation, which bear TCRs with low reactivity toward self-Ags because of the thymic selection process (5), gain the ability to respond to autoantigens. In this context, it is noteworthy that diverse peptides with weak reactivity toward the TCR can be cross-reactive because of structural mimicry (46). Similarly, heterologous virus infection has been shown to activate low-avidity autoreactive CD8 T cells (49). Mechanisms by which weak TCR agonists could overcome the signaling threshold required to activate naive, potentially autoreactive T cells in a physiological setting is not clear. This question is difficult to address in animals bearing a polyclonal TCR repertoire, whereas engineered animal models with TCR transgenic CD8 T cells specific to defined Ags allow the testing of peptide ligands of differing agonistic potential (6). After careful evaluation of the available experimental models to address the potential role of cytokine priming in lowering the TCR signaling threshold of autoreactive CD8 T cells, we chose the RIP-GP/P14 model (6, 17). The low-level expression of LCMV GP in the islets allows P14 cells to escape central and peripheral tolerance mechanisms, and the relatively low affinity of the P14 TCR minimizes its activation by promiscuous peptides (50, 51). In another engineered T1D model, the OT-1 TCR transgenic CD8 T cells are deleted within the double-transgenic RIP-OVA/OT-I mice expressing OVA in the islets, whereas OT-I cells allowed to mature in animals that do not express the transgenic Ag spontaneously induce T1D upon adoptive transfer to RIP-OVA mice, presumably because of the high “reactivity” of the OT-1 TCR to the transgenic ligand (52–54). Similarly, female NOD mice expressing the 8.3 transgenic TCR specific to an islet-specific autoantigen develop insulitis by 3 wk and overt diabetes by 2–3 mo of age (25). In RIP-OVA/OT-1 and NOD.8.3 models, stimulation of TCR transgenic CD8 T cells by the transgenic and endogenous autoantigens render it impossible to distinguish the role of prior cytokine priming in the initial triggering of autoreactive CD8 T cells. Furthermore, the multiple genetic susceptible loci of the NOD background, which would compound the interpretation on the role of the priming cytokines, are of less concern in the C57BL/6 background of the RIP-GP/P14 model. Therefore, even though the RIP-GP/P14 mouse is an engineered animal model, it closely mimics the state of a potentially autoreactive naive CD8 T cell that can get stimulated under appropriate conditions by a weak TCR ligand and gain pathogenic potential to initiate autoimmune destruction of the target organ. Hence, the RIP-GP/P14 mouse model of T1D is ideal to investigate the role of cytokine priming in the initial triggering of autoreactive CD8 T cells by weak TCR agonists. Our findings on the RIP-GP/P14 model of T1D strongly indicate that IL-15 and IL-21, produced during innate inflammatory response to infections (55–57), could be important host-specific factors that facilitate stimulation of potentially autoreactive CD8+ T cells by autoantigens or by foreign, structurally analogous, peptide mimics. Mackall and colleagues (58) have previously shown that administration of IL-7 or IL-15 to C57BL/6 female mice during immunization with the male-specific HY Ag increases the frequency of effector CD8 cells reactive to the subdominant Smcy peptide, suggesting that cytokine priming might operate in vivo. We resorted to in vitro cytokine priming over in vivo cytokine administration in our T1D model for two reasons. The priming cytokines, particularly IL-15 and IL-21, modulate the functions of other cell types such as mast cells, macrophages, dendritic cells, and NK cells (32, 59–61), which would render it difficult to assess the effect of cytokine priming specifically on CD8 T cells. In addition to non-T cells, resident T cells of the recipients will compete for the injected cytokines, requiring large doses of cytokines over a prolonged period to ensure their availability to the adoptively transferred P14 cells. In contrast, during the brief one-time in vitro cytokine-priming method that we have used, CD8 T cells were exposed to the priming cytokines that are likely to be abundant in the local inflammatory tissue and in the draining lymph nodes. Moreover, the CD8 T cells were exposed for a period of 36–40 h, which is well within the 48-h period required for T cells entering the circulation to transit through the draining lymph nodes and to begin the next cycle of migration (62). Furthermore, washing the primed cells before adoptive transfer would eliminate the direct effect of the priming cytokines on other cell types in the host. Even though P14 cells primed with IL-7 and IL-21 showed increased proliferation and effector functions in response to stimulation with either W4Y or suboptimal dose of gp33 (Figs. 1, 2), these cells did not cause diabetes following transfer to RIP-GP mice (Fig. 5A, group B4). One possible reason for the failure of P14 cells primed with IL-7 and IL-21 to become pathogenic in vivo could be differential effects of these cytokines on other functions of CD8 T cells. Whereas IL-7 is critical for the survival of T cells, IL-15 not only delivers a survival signal but also modulates several functions on T cells (63). It is possible that IL-15 may modulate the expression of surface molecules and cellular functions that enable efficient homing of the cytokine-primed P14 cells to the islets. For example, addition of IL-15 to Ag-stimulated CD8 T cells sustains the expression of the chemokine receptor CCR7, which facilitates egress of naive and central memory cells from high endothelial venules in the draining lymph nodes to forage for Ags (64, 65). Furthermore, IL-15 was still needed in vivo for the cytokine-primed P14 cells stimulated with weak TCR ligands to cause disease. Because IL-15 alone can induce proliferation of memory CD8 T cells (66), it is also possible that the cytokine-primed cells that had received a weak TCR signal might have relied on endogenous IL-15 for their expansion and to sustain their effector functions. Furthermore, IL-15 is known to modulate the functions of APC (59). Therefore, in addition to promoting the expansion of cytokine-primed cells that have received a weak TCR stimulus and sustaining their migratory potential, it is possible that endogenous IL-15 may perpetuate the pathogenic process initiated by cytokine-primed effector P14 cells leading to islet destruction. IL-21 is a proinflammatory cytokine produced by NKT and Th17 cells (57, 67). An earlier report implicated IL-21 in the homeostatic expansion of CD8 T cells in the NOD mouse model of T1D (47). Recent studies using IL-21Rα–deficient NOD mouse have confirmed the requirement for IL-21 to induce diabetes (8, 10). 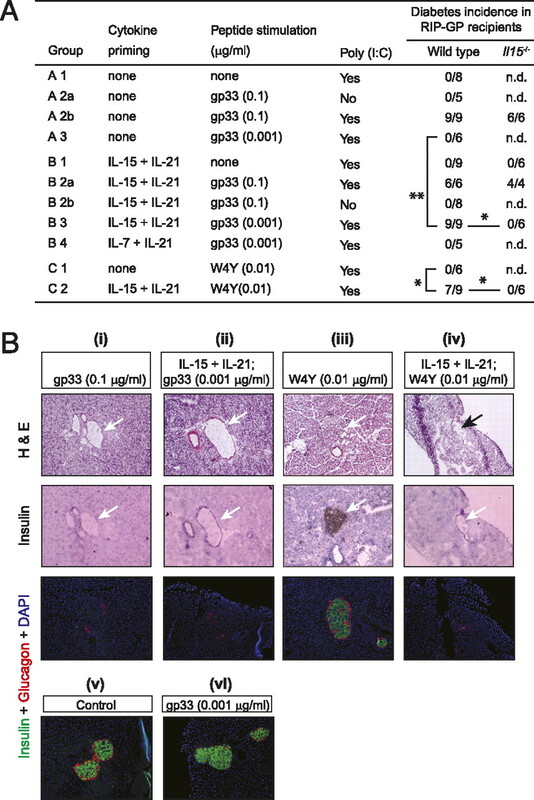 However, these studies suggested that a defective Th17 response might underlie the inefficient T cell infiltration of the pancreatic islets in IL-21Rα–deficient NOD mice. In the light of our findings, we propose that the priming effect of IL-21 in synergy with IL-15 to enhance the TCR sensitivity of autoreactive CD8 T cells could also be an important pathogenic mechanism that is defective in IL-21Rα–deficient NOD mice. Our findings concur with the general idea that increased TCR signaling could promote the activation of autoreactive CD8 T cells by weak TCR ligands (6). The gain in Ag responsiveness of cytokine-primed P14 cells appears to be a collective manifestation of several molecules and costimulatory receptors that could increase the strength of TCR signaling. It has been shown that reactivity to weak agonists requires high TCR density (68), and blockade of CD8 inhibits the peptide-specific activation of low-avidity CD8 T cells (29, 69). CD5 is implicated in the negative regulation of TCR signaling via recruitment of the protein tyrosine phosphatase SHP-1 to ITIMs to the CD3:TCR complex (34, 35). In fact, the expression of CD5 is directly proportional to the avidity of the TCR (70, 71). Similarly, CD28 and GITR can promote responsiveness to suboptimal TCR stimulation (40, 41). Therefore, an increase in the expression of TCR, CD8, CD28, and GITR and a decrease in the expression of CD5 in cytokine-primed cells could collectively enhance the strength of TCR signaling elicited by weak agonists. In addition to modulating the expression of molecules that influence TCR signaling as discussed above, cytokine priming might influence TCR signaling indirectly via activation STAT5. STAT5 and TCR signaling pathways are reported to synergize during T cell activation by Ag (72–74). We have shown that IL-21, which signals mainly via STAT3 (14, 75), enhances the phosphorylation of STAT5 induced by IL-15 in naive CD8 T cells (14). We have also observed that priming with IL-21 and IL-15, but not either of these cytokines alone, caused a modest increase in the expression of IL-21Rα, which could promote the initial activation of autoreactive CD8 T cells and their ability to cause disease. This notion is consistent with the recent reports of IL-21 requirement for efficient primary and secondary CD8 T cell responses toward viral Ags (76–80). Clearly, studies aimed at defining how priming with IL-21 influences the intracellular TCR signaling pathways in response to weak agonists will further our understanding of the initial activation of naive autoreactive CD8 T cells. ↵1 S.R. and S.I. share senior authorship. This work was supported by the Natural Sciences and Engineering Research Council (Canada) Discovery Grant 342179-2009 (to S.I.) and the Canadian Institutes for Health Research Operating Grant MOP-86530 (to S.R.). S.I. is a recipient of the Canadian Institutes for Health Research new investigator award. X.-L.C. is supported by a doctoral fellowship from the Fonds de la Recherche en Santé Québec. The Centre de Recherche Clinique Étienne-Le Bel du Centre Hospitalier Universitaire de Sherbrooke is a Fonds de la Recherche en Santé Québec-funded research center.
. 2005. CD8+ T cells in autoimmunity. Curr. Opin. Immunol. 17: 624–631.
. 2005. Cellular and genetic mechanisms of self tolerance and autoimmunity. Nature 435: 590–597.
. 2004. TCR affinity and negative regulation limit autoimmunity. Nat. Med. 10: 1234–1239.
. 2008. IL-6–dependent spontaneous proliferation is required for the induction of colitogenic IL-17–producing CD8+ T cells. J. Exp. Med. 205: 1019–1027.
. 2008. IL-21 limits peripheral lymphocyte numbers through T cell homeostatic mechanisms. PLoS ONE 3: e3118.
. 2008. CD4 T cells, lymphopenia, and IL-7 in a multistep pathway to autoimmunity. Proc. Natl. Acad. Sci. USA 105: 2999–3004.
. 2009. Antibody-mediated blockade of IL-15 reverses the autoimmune intestinal damage in transgenic mice that overexpress IL-15 in enterocytes. Proc. Natl. Acad. Sci. USA 106: 15849–15854.
. 2008. IL-6, in synergy with IL-7 or IL-15, stimulates TCR-independent proliferation and functional differentiation of CD8+ T lymphocytes. J. Immunol. 180: 7958–7968.
. 2010. Increased antigen responsiveness of naive CD8 T cells exposed to IL-7 and IL-21 is associated with decreased CD5 expression. Immunol. Cell Biol. 88: 451–460.
. 2009. Cytokine synergy in antigen-independent activation and priming of naive CD8+ T lymphocytes. Crit. Rev. Immunol. 29: 219–239.
. 1991. Ablation of “tolerance” and induction of diabetes by virus infection in viral antigen transgenic mice. Cell 65: 305–317.
. 2000. Role of antigen-presenting cells in mediating tolerance and autoimmunity. J. Exp. Med. 191: 2021–2027.
. 2003. TCR binding kinetics measured with MHC class I tetramers reveal a positive selecting peptide with relatively high affinity for TCR. J. Immunol. 171: 2427–2434.
. 1999. Absence of co-stimulation and not the intensity of TCR signaling is critical for the induction of T cell unresponsiveness in vivo. Eur. J. Immunol. 29: 2156–2166.
. 1997. Four types of Ca2+ signals in naive CD8+ cytotoxic T cells after stimulation with T cell agonists, partial agonists and antagonists. Eur. J. Immunol. 27: 3414–3419.
. 2007. IL-21 promotes T lymphocyte survival by activating the phosphatidylinositol-3 kinase signaling cascade. J. Leukoc. Biol. 82: 645–656.
. 1997. Spontaneous autoimmune diabetes in monoclonal T cell nonobese diabetic mice. J. Exp. Med. 186: 1663–1676.
. 1999. Prevalent CD8+ T cell response against one peptide/MHC complex in autoimmune diabetes. Proc. Natl. Acad. Sci. USA 96: 9311–9316.
. 2003. Identification of the β cell antigen targeted by a prevalent population of pathogenic CD8+ T cells in autoimmune diabetes. Proc. Natl. Acad. Sci. USA 100: 8384–8388.
. 2001. Expansion of the antigenic repertoire of a single T cell receptor upon T cell activation. J. Immunol. 167: 655–666.
. 2001. Functional avidity maturation of CD8+ T cells without selection of higher affinity TCR. Nat. Immunol. 2: 711–717.
. 2000. Progression of autoimmune diabetes driven by avidity maturation of a T-cell population. Nature 406: 739–742.
. 2008. The proline-rich sequence of CD3epsilon as an amplifier of low-avidity TCR signaling. J. Immunol. 181: 243–255. 2004. Targeting the interleukin-15/interleukin-15 receptor system in inflammatory autoimmune diseases. Arthritis Res. Ther. 6: 174–177.
. 2005. SOCS-1 regulates IL-15–driven homeostatic proliferation of antigen-naive CD8 T cells, limiting their autoimmune potential. J. Exp. Med. 202: 1099–1108.
. 2005. IL-21 sustains CD28 expression on IL-15–activated human naive CD8+ T cells. J. Immunol. 175: 755–762.
. 2010. IL-21 preferentially enhances IL-15–mediated homeostatic proliferation of human CD28+ CD8 memory T cells throughout the adult age span. J. Leukoc. Biol. 87: 43–49.
. 2010. MART-1–specific melanoma tumor-infiltrating lymphocytes maintaining CD28 expression have improved survival and expansion capability following antigenic restimulation in vitro. J. Immunol. 184: 452–465.
. 2005. IL-21 influences the frequency, phenotype, and affinity of the antigen-specific CD8 T cell response. J. Immunol. 175: 2261–2269.
. 2003. CD28-mediated co-stimulation: a quantitative support for TCR signalling. Nat. Rev. Immunol. 3: 939–951.
. 2003. Microorganisms and autoimmunity: making the barren field fertile? Nat. Rev. Microbiol. 1: 151–157.
. 2006. Molecular mimicry, bystander activation, or viral persistence: infections and autoimmune disease. Clin. Microbiol. Rev. 19: 80–94.
. 2001. Autoimmunity provoked by infection: how good is the case for T cell epitope mimicry? Nat. Immunol. 2: 797–801.
. 2003. A new look at viruses in type 1 diabetes. Diabetes Metab. Res. Rev. 19: 8–31.
. 2009. T cell-mediated autoimmune disease due to low-affinity crossreactivity to common microbial peptides. Immunity 30: 348–357.
. 2009. Hepatic interleukin-7 expression regulates T cell responses. Immunity 30: 447–457.
. 2006. T cells with low avidity for a tissue-restricted antigen routinely evade central and peripheral tolerance and cause autoimmunity. Immunity 25: 261–270. 2005. Molecular and cellular mechanisms, pathogenesis, and treatment of insulin-dependent diabetes obtained through study of a transgenic model of molecular mimicry. Curr. Top. Microbiol. Immunol. 296: 65–87.
. 2004. Dual T cell receptor T cells with two defined specificities mediate tumor suppression via both receptors. Eur. J. Immunol. 34: 1882–1891.
. 1996. Induction of autoimmune diabetes by oral administration of autoantigen. Science 274: 1707–1709. 2000. Cross-presentation: inducing CD8 T cell immunity and tolerance. J. Mol. Med. 78: 326–332.
. 2009. T-cell receptor binding affinities and kinetics: impact on T-cell activity and specificity. Immunology 126: 165–176.
. 2001. IL-15 is expressed by dendritic cells in response to type I IFN, double-stranded RNA, or lipopolysaccharide and promotes dendritic cell activation. J. Immunol. 167: 1179–1187.
. 2005. Adjuvant IL-7 or IL-15 overcomes immunodominance and improves survival of the CD8+ memory cell pool. J. Clin. Invest. 115: 1177–1187.
. 2001. Migration of naive, effector and memory T cells: implications for the regulation of immune responses. Immunol. Rev. 184: 20–37.
. 2005. IL-7 and IL-15: therapeutic cytokines for immunodeficiency. Trends Immunol. 26: 56–64.
. 2001. Effector differentiation is not prerequisite for generation of memory cytotoxic T lymphocytes. J. Clin. Invest. 108: 871–878.
. 1998. Potent and selective stimulation of memory-phenotype CD8+ T cells in vivo by IL-15. Immunity 8: 591–599.
. 2008. TCR antagonism by peptide requires high TCR expression. J. Immunol. 181: 1760–1766.
. 2003. Interplay between TCR affinity and necessity of coreceptor ligation: high-affinity peptide-MHC/TCR interaction overcomes lack of CD8 engagement. J. Immunol. 171: 4493–4503.
. 2004. A role for TCR affinity in regulating naive T cell homeostasis. J. Immunol. 172: 40–44.
. 1999. STAT5 interaction with the T cell receptor complex and stimulation of T cell proliferation. Science 283: 222–225.
. 2003. Stat5 synergizes with T cell receptor/antigen stimulation in the development of lymphoblastic lymphoma. J. Exp. Med. 198: 79–89.
. 2006. Temporal cross-talk between TCR and STAT signals for CD8 T cell effector differentiation. Eur. J. Immunol. 36: 3090–3100.
. 2010. IL-21 deficiency influences CD8 T cell quality and recall responses following an acute viral infection. J. Immunol. 185: 4835–4845.
. 2010. Critical role for IL-21 in both primary and memory anti-viral CD8+ T-cell responses. Eur. J. Immunol. 40: 3085–3096.